Wurth USA is dedicated to creating and distributing quality products that meet the highest standards of craftsmanship, longevity, and environmental responsibility. 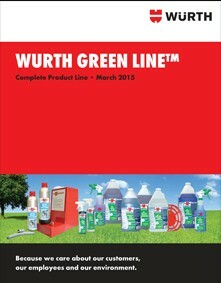 To that end, Würth has created the WURTH Green Line™, a complete line of environmentally responsible products for the automotive repair and maintenance industries. With Würth’s EcoLogo certified line of green automotive products, customers can do their part to protect the environment. Body shops, cargo companies, fleet maintenance shops, motorcycle repair shops, vocational schools, and government operations managers can all lessen their harmful impact upon the earth simply by making the switch to these powerful products. Wurth USA offers steel wheel weights and zinc wheel weights as a greener alternative without sacrificing important characteristics such as retention and corrosion resistance. Switching to lead-free alternatives such as steel or zinc will allow each of us to reduce the impact of lead accumulation in our environment. These weights have the same functionality, appearance and fit characteristics as conventional wheel weights. These non-lead wheel weights are designed and produced for cars with both steel and alloy wheels, and are coated with a protective coating to ensure corrosion resistance. Another way that Würth endeavors to protect the environment is through its Lead Wheel Weight Recycling Program. Wheel weights are clipped to the rims of car wheels to help balance the tires. Every car in America is sold with a wheel weight attached to each wheel, and the vast majority of these weights are made of lead. Lead has been linked to brain damage, learning disabilities, and permanent nervous system damage. For this reason, lead was banned from paint and gasoline in the 1970s. However, despite these risks, lead has not been federally banned in wheel weights, though several states have banned wheel weights within their borders. The lead in wheel weights may cause little harm when attached to a car, but all too often wheel weights become loose and fall off. These lost wheel weights end up in storm sewers, contaminating waterways and land. Würth is working to reduce the harmful effects of lead wheel weights by offering wheel weights made of steel and zinc. It is a well known fact that making the switch to zinc and/or steel wheel weights could significantly reduce the harmful effects of lead upon the environment. Würth makes it easy for customers within automotive industry to make the switch to steel or zinc wheel weights. With the company’s environmental compliance assistance program, customers inform Würth that they have lead wheel weights that they would like to properly dispose of and Würth provides them with the necessary packaging and pre-paid postage to recycle their wheel weights with ease. To learn more about the green automotive products offered by WURTH Green Line™ or to inquire about the company’s eco-friendly programs, contact us today!